Yesterday, a pelican crossed my path as I started out on my Lenten journey of Cultivating Sacred Space. Admittedly, it was not an actual flesh-and-blood pelican, but its appearance in my life on Ash Wednesday was fortuitous, nevertheless. This particular pelican was gifted to me from someone who was and is an important part of my faith journey, and who has come to know me well this past year. She was travelling, saw the pelican, and brought it back as a gift for me. 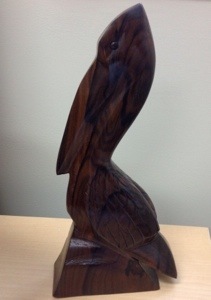 She noted that this bird, now beautifully captured in smooth, polished South American mahogany, had been carved with a machete. That seems implausible to me as a non-sculptor, but I can see the large cuts now smoothed over in the wood. I trust the story. We both recognized the pelican as a Christian icon, but were a little fuzzy on the details and derivation of its meaning. Of course, that made it an even better gift from my perspective, because it came with a quest for knowledge. She probably suspected that would be the case! I came home last night, carrying my pelican in my purse. My work day had been marked by a peculiar academic tradition: a dissertation defense. As “Chair”, I bequeathed the title of “Doctor” to my student with the support of her committee of mentors. Some change takes place in that time that is both literal (you passed!) and symbolic (so what does that mean?). We marked the induction with a celebratory toast of champagne, and the signing of official documents. I then went to Ash Wednesday service at my church, rich with symbolism of ashes, dust, chrism, life, death filling music and liturgy. I swooped back home to help my fifth grader with her history homework that involved taking in the mythic story of another culture, the Ramayana, and trying to put that into her still developing understanding how culture and rules and stories shape who we are as social beings. Finally, after a day of much symbolism, my pelican and I settled down together and started to explore a bit deeper into its own symbolic meaning. I started with what I knew: in Christian iconography, the pelican is used as a symbol of Jesus Christ. What was more fascinating, though, was to learn why. Like many ancient icons, the story on which it is based is dubious at best. The lore of the pelican is that the male pelican would seemingly kill its children in an attempt to care for them (think large, pointy beaks). The mother pelican would find her young seemingly dead children and, piercing her own breast with her beak, use her blood to revive the fledgling pelicans. After three days, the birds returned to life. One can see why this metaphor became symbolically linked to the pelican icon as both the charity, and atonement, linked with resurrection. The first thing that happened is that the scientist in me scoffed at the misconstrued notions of paternal and maternal roles in the symbolic icon’s actual animal origins. Then, it dawned on me like a flash: I spend every day of my scholarly life dealing with the misconceptions and perceptions around parents…mothers and children, in particular. I find myself sitting in homes where great love has been out poured by young mothers on even younger infants, at the same time that the world is scoffing at (or has written off) these same women, preferring to judge rather than to understand. Even without the religious interpretation, the pelican’s symbolism of compassion for the misunderstood instantly held meaning and significance. Adoro te devote, latens Deitas, quae sub his figuris vere latitas: tibi se cor meum totum subiicit, quia te contemplans totum deficit. Visus, tactus, gustus in te fallitur, sed auditu solo tuto creditur; credo quidquid dixit Dei Filius: nil hoc verbo Veritatis verius. In cruce latebat sola Deitas, at hic latet simul et humanitas; ambo tamen credens atque confitens, peto quod petivit latro paenitens. Plagas, sicut Thomas, non intueor; Deum tamen meum te confiteor; fac me tibi semper magis credere, in te spem habere, te diligere. O memoriale mortis Domini! panis vivus, vitam praestans homini! praesta meae menti de te vivere et te illi semper dulce sapere. Pie pellicane, Iesu Domine, me immundum munda tuo sanguine; cuius una stilla salvum facere totum mundum quit ab omni scelere. Iesu, quem velatum nunc aspicio, oro fiat illud quod tam sitio; ut te revelata cernens facie, visu sim beatus tuae gloriae. Amen. to my taste thy sweetness neverfailing give. The pelican disappears in the hymn’s lyrics, but the metaphor remains. The longing for faith…not proven, but experienced…is what resonates with me. Literal interpretation isn’t necessary to take in deep symbolic meaning. Isn’t that the way it is with our icons, really. And with our faith more broadly. It isn’t the object, or even the literal translation of the form. It is the deep, inner meaning that strikes a chord in our spirits and gives us something to hold on to, an image to guide us in our stillness, a familiar friend on a sometimes unfamiliar journey, a knowledge of something deeper than our literal minds can grasp. The journey of this Lenten season is to go deeper, to be still and know. This knowing is not just with our eyes and ears and senses, but with the trust of spirit that guides us as we listen deeply. I am grateful today for my gift of the pelican, another small point of light to guide my journey. This entry was posted in Lent 2014, Spiritual journey and tagged aquinas, Christianity, faith, icon, Jesus, Lent, pelican, symbolism. Bookmark the permalink.